Excursion to Aiguille Du Midi by cable car. Get a unique view of all Paris from the 2nd level of Eiffel tower. Perfume shopping experience at Fragonard in Paris. Hotel Nh Waalwijk Or SimilarAn additional amount of INR 1,500/- per person is to be compulsorily paid by way of "Secure Your Booking Amount". Any increase in the airfare / taxes / routing charged by the airlines for ticket (presently calculated on 14th Aug, 2015). This morning an enjoyable drive to Lucerne with its picturesque mountains, lakes, cowbells, alpine villages and meadows, the poignant Lion Monument, the covered, wooden Kapellbrucke (Chapel bridge), and the ornate Jesuit Church. Later enjoy a comfortable drive to the scenic splendour of Chamonix Mont Blanc. It's 'Love at first sight' as you enter the beautiful Chamonix Valley and the majestic mountains of the Mont Blanc range. After dinner, check into your hotel. Today enjoy our excursion tour - a ride on the highest and most impressive cable car, the Aiguille du Midi, lifts you to 3842 meters for an unforgettable view of the Alps. The more fearless will take A STEP INTO THE VOID, onto a 2.50 m glass cage out over a 1000 m precipice. A product of modern architectural and technical prowess and a sensation packed experience. The Aiguille du Midi has its own postage stamp and a letterbox! Continue your excursion with a ride on the nostalgic red cog railway to Montenvers. The train climbs a steep track, through scenic Alpine scenery, to a stunning vantage point above the 'Mer de Glace' (sea of ice) Glacier. You know you've really arrived when you stand at 1913 meters, at the 'Mer de Glace', which is 7 kms long and 200 meters thick, with a surface dimension of 40 kms! Today, after an early breakfast, drive to Geneva, one of Switzerland's most privileged cities, said to have the second highest quality of living in the world! We begin the visit with a drive to the Palais des Nations (the European Headquarters of the United Nations) and the Musee Ariana. Be awestruck by the great white plume of the world's tallest fountain in Europe - the magnificent Jet d'Eau and pause for a photograph here and at the beautiful floral clock in the Jardin Anglais! 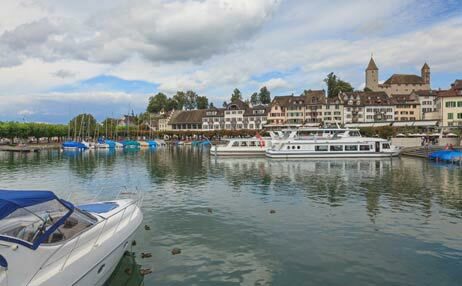 Then enjoy a spectacular journey and experience the natural beauty and wonders of the alpine region as you enjoy a comfortable drive of approximately seven hrs. to Paris, the 'City of Lights'. On arrival in Paris after dinner, check into your hotel. Enjoy a guided panoramic highlight city tour of famous monuments like the Pyramid of the Louvre, Garnier's Opera, the largest opera theatre in the world, the River Seine, the Place de la Concorde - the site of the infamous guillotine, the Champs Elysees - one of the most fashionable streets in the world, the Napoleanic Arc de Triomphe and the Hotel des Invalides. Drive through Dutch countryside. Let the Windmills which still wield their magic enchant you. There's a photo stop at one. Spend some free time at Dam Square with the Nieuwe Kerk (New Church), the Royal Palace and the National Monument. Later drive to your hotel. Overnight in the Netherlands area. Breakfast at the hotel and Indian dinner at the hotel. 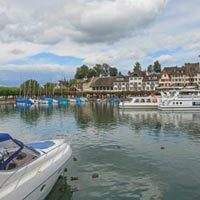 Continue your scenic drive to Cologne, the metropolis on River Rhine, where on arrival you will visit the Cathedral - the first Gothic Church in the Rhineland with its characteristic spires. A short drive to Frankfurt. Enjoy some free time at the 'Altstadt' - old section of the town. After dinner, check into your hotel. 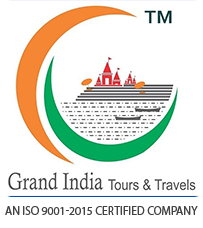 An additional amount of INR 1,500/- per person is to be compulsorily paid by way of "Secure Your Booking Amount".